Dell Canvas PenThe Dell Canvas Pen is an essential part of the Dell Canvas experience, providing users with a highly precise pen capable of providing over 4096 levels of pressure sensitivity, tilt recognition, and an onscreen radial menu. Fitted with a default but removable HB hardness tip it also allows the users to customize the feel of the pen on the screen with a variety of three different pen nibs (tips) available with the Dell Canvas Pen Holder with Nibs. The Dell Canvas Pen is a highly-precise tool for sketching, navigation, and input in a dual-handed environment where interacting with your system and content feels natural and intuitive. The Dell Canvas pen is based on Wacom's electro-magnetic resonance (EMR) technology, providing 2,056 levels of pressure sensitivity, tilt recognition, rotation, and many more features. The pen becomes not just a mouse replacement, but a powerful tool for capturing ideas and turning creative vision into reality. The design of the pen ensures that it feels comfortable in your hands for extended periods of interaction. Two programmable buttons allow the user to fully customize the pen experience, with options like left/middle/right click and custom keyboard shortcut options programmed to the pen's buttons. No batteries are required for this pen. The Dell Canvas Pen is an essential part of the Dell Canvas experience, providing users with a highly precise pen capable of providing over 4096 levels of pressure sensitivity, tilt recognition, and an onscreen radial menu. 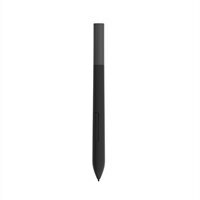 Fitted with a default but removable HB hardness tip it also allows the users to customize the feel of the pen on the screen with a variety of three different pen nibs (tips) available with the Dell Canvas Pen Holder with Nibs.